I did NOT drop my contact lens down the drain. And while my dear husband was retrieving it he did NOT break the pipe. And it was NOT Saturday night after the Home Depot was closed. And since we did NOT have a house guest, and there were NOT 10 people using the bathroom, there was NO need for him to NOT fix it using a funnel and packing tape. I would NEVER sit up until one o'clock in the morning playing Monopoly. That would NOT be wise because the headache is NOT worth the million laughs we had. And I did NOT win all the properties and bankrupt everyone else. It would NEVER be nice to take someone's last dollar. And besides I NEVER win. NOR did NOT run out of houses and hotels to buy. And I definitely would NEVER use the word Booyah to flaunt my win. That would NOT be very kind. And besides I do NOT even know what Booyah means! Emma and Aedan did NOT raid Allen's office for EVM boxes to make laptops. NOR did they decorate pages to tape inside the covers to be different blog pages. And when Nathaniel saw their blogs he did NOT tell me that after he finished eating he was going to make his own blog. And he definitely did NOT tell me that his would be flamingo pink! Sorry about that broken pipe. Glad you were able to have fun with your guest...and way to win Monopoly! At least the hubs is a problem solver! I like their laptops and blogs - they sure know how to design. I bet it was so much fun playing Monopoly - what version is that? It's nice to win every now and then. How fun. Love the funnel idea. What a great idea!! Thanks for your sweet comments on my blog. I think I am going to hang in there with Vista. I have a free upload to Windows 7 when it comes out, so I'll hang in there. Oh Kat! That is too funny about the drain. When I saw the picture, I immediately thought of my grandpa who could fix anything with duct tape. haha and my husband who is able to figure anything out as well. It is wonderful to have problem solving husbands huh? 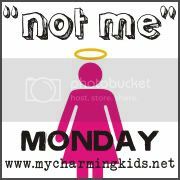 Loved your not me post! Laughed a lot. I use to play monopoly a lot as a kid! Wow, how resourceful is your husband!! Love the funnel! Thanks for checking in about my mixer. I love it and have made some sort of sweet bread -- banana, pumpkin, zucchini - every week and today I made homemade flour tortillas, but I still haven't tried your homemade bread recipe. I hope to very soon! I think next time I go to the grocery I'm just not going to buy sandwich bread and that will force me to make some!